This Presidential relative wants national police leadership under Chief Inspector Espenido. 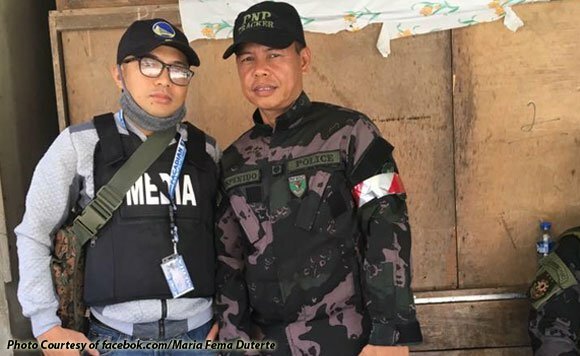 President Rodrigo Duterte’s niece, Maria Fema T. Duterte is rooting for Ozamiz City Police Director Jovie Espenido to be the next in line chief of the Philippine National Police. 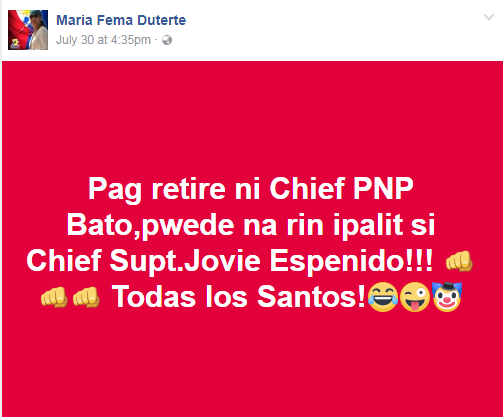 On her Facebook account, the Presidential relative said that the controversial police leader who has been active on his anti-drugs campaign, could be take Chief Bato Dela Rosa’s place once he decides to retire. She also lauded the police chief a day after the bloody raid in the homes of the drug-linked Parojinog family. “Ozamiz City, Chief of Police Supt.Jovie Espenido,Mi Saludo! #PartnerForChange”, she said on her Facebook account, adding that a lot of town now want Espenido to spearhead their local police units.